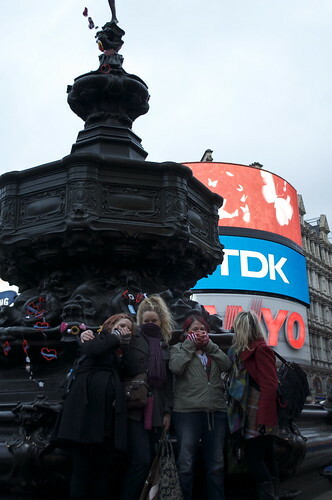 On a very cold Sunday a few weeks ago, the Knit The City girls and I descended on Picadilly circus to give a little bit of wooly love to the Eros statue. 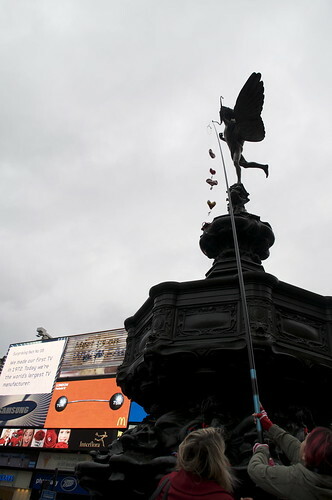 We met before hand in a local pub and hastily stitched, glued and buttoned our finishing touches to our pieces, before heading to the statue to place them carefully at the base of Eros. 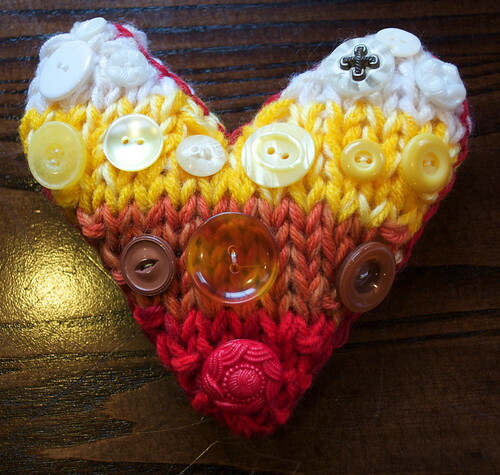 As it was Valentines day the next day it had seemed only fitting that everything was love and valentines day related. Deadly Knitshade chose to portray the fight between the 2 brothers – Eros and Anteros. 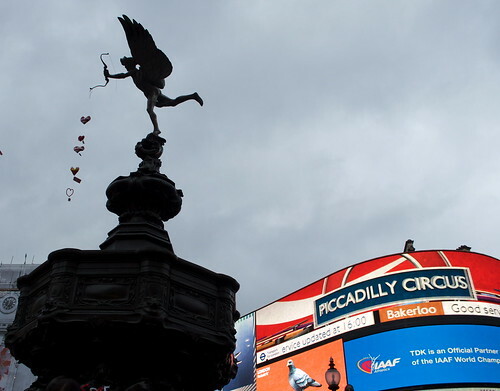 (A little known fact is that the statue is actually of Anteros and not in fact Eros, although we all call it Eros). 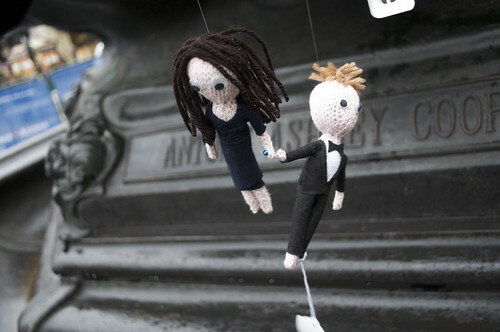 Lady Loop and Shorn-a-the-dead decided to go on a Will and Kate theme, with Shorn-a creating the doting couple in knitted form and L.Loop hand stitching weblinks onto red hearts to hang from the bottom of the statue- genius idea if you ask me! 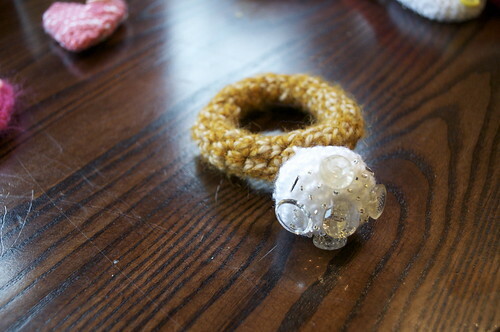 I went along the love theme and created a big L O V E, some buttoned hearts and a huge blingtastic engagement ring. Last but not least came our storming finale – deadly had brought a huge 6 metre pole along, which we each fastened a heart to. With us all directing and concentrating so much on the task in hand, we hadnt noticed a large crowd growing behind us. 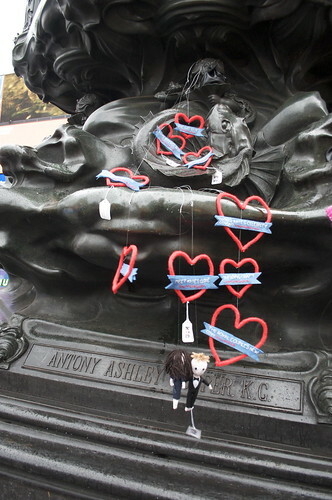 When we finally attached the hearts to Eros’ bow we heard a great cheer… a first for our yarnstorms, and a great feeling! Lady Loop and Deadly Knitshade carefully position the ever swaying 6 metre pole. 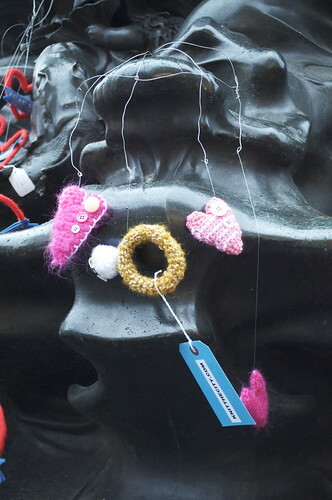 Knit The City: If we cover our faces you'll have no idea who did it. 17 Feb	This entry was published on February 17, 2011 at 5:19 pm. 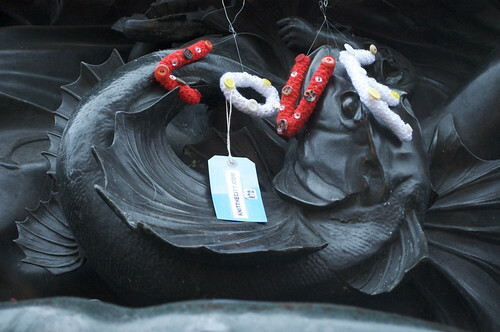 It’s filed under Amigurumi, I made this!, Knitting, Yarn Storms and tagged Amigurumi, art, craft, graffiti, guerilla knitting, knit the city, knitting, knitting graffiti, street art, the fastener, yarn bomb, yarn storm, yarnbomb, yarnbombing, yarnstorm. Bookmark the permalink. Follow any comments here with the RSS feed for this post. I’ve subscribed to you blog and look forward to future posts.